Persistence is key when it comes to deconstructing the mysteries placed before us by a piece such as The Space Between. Plunging the depths of a work comes not just from consuming it, but savoring it, allowing it to overtake the palette and linger on the tongue. It needs a delicate touch to work through it, to parse the meaning between the walls. These endless constructions must be torn down for us to get to a deeper understanding of what it is that Christoph Frey wants to convey to us. Continuing from Part 1, today we take a closer look at the themes underlying and supporting the stage on which Martin’s narrative is set. 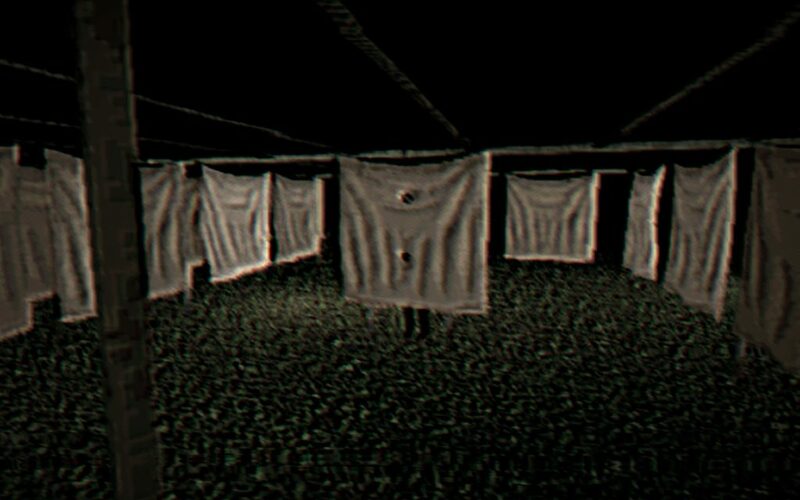 Within this Hell, hopefully we can uncover some greater truth to the game, and pick apart its architecture. Duality seems to be a running theme throughout The Space Between. Uncertainty and doubt plague Martin in the present as Clara is seemingly desperate to become closer to him, his trauma creating paradox and dilemma. These stubborn regrets hold him back from moving forward and becoming the person he wishes to be. He obsesses over the barriers established between us all, stopping us from truly feeling one another. On one hand, he seems keen on becoming close to Clara, on understanding her and making her feel comfortable in this place he made for himself, on impressing her with his accomplishments, being understood. On the other hand, he longs to be back in that blanket fort, pressing his hand against Daniel’s, grateful to exist within the fragment of time the two share. Walls need not be made of matter, after all, and as such, walls can be erected by the pain of love cut short. Those places we return to in our minds only exist through that remembrance, thus pulling them out of the flow of time and forever freezing them as idyllic versions of what was, and we too, wherever we may be in reality, can exist within those bubbles of thought, if only for a brief moment. Reinforcing the notion that we can exist in multiple places at once, perhaps even allowing us to be multiple people at the same time, Frey’s subtitles convey the words shared between people without attributing them to any specific character. Much like Cormac McCarthy, Frey leaves it up to the player to determine who is speaking at any given moment, letting fears or questions linger between the characters, blending them together in a way that begs the viewer to ask: who is Martin? Clara? Daniel? Are they reflections of one another or truly independent entities? In some ways, they do serve as fragments of one another, their conversations open to interpretation by any reader. Clara to me is Martin to another, and so on. These people may be versions of one another cast apart metaphysically, only reuniting in this purgatory for a brief moment in the service of understanding themselves. Regardless, Martin fears his impermanence, obsessing over the dead and the brief moment they shared when they truly were together. “Both,” he says, feeling the veil of the afterlife between the two, but still feeling Daniel’s hand pressed against his. He begs the question of what will be left when he no longer is. He leaves behind these hollow buildings, facades of his own terrors, going so far as to endlessly carve and sketch blueprint-like abstract geometries. Within these walls, these drawings he endlessly repeats, he attempts to create a womb – a space created specifically for him, in which he exists purely as his own entity. He’s been obsessed with the safety of a womb since childhood, his blanket fort becoming the uterus, the two chairs propping up the blanket serving as ovaries. As he reaches against the blanket, he becomes akin to a baby pressing against its mother’s uterine lining, against the hand brushing it, a social creature instinctively looking for another in its reality. Within our own universes, we are trapped in the limited perspective we alone inhabit. Truly, in the barest sense of the word, we are all alone in this life. You only exist within your own mind; a player of the game removed from anyone else’s. That faint scrape against the edges of human boundary, the moments where we actually feel connected with another, where the barriers shatter and it’s as if you finally realize the depth to which our reality is tied to all others’. Is it enough for us all, though? What if that shared substance, the materiality of life lived together, should not persist? Should be unrequited? 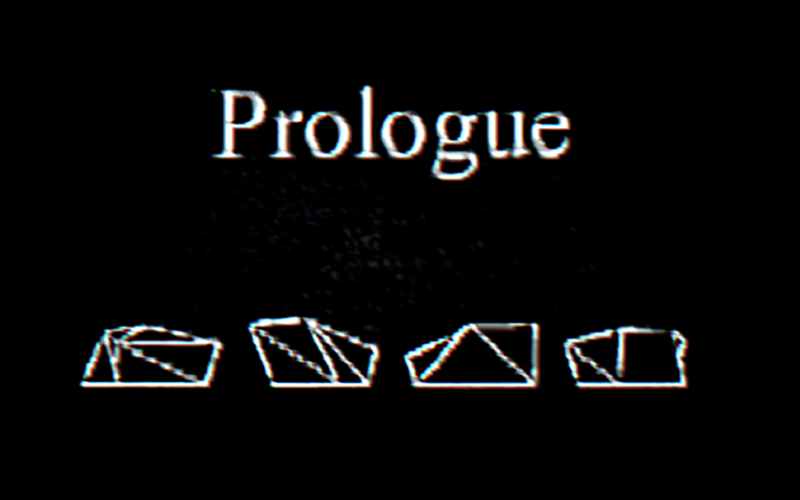 The “sacred geometry” constant throughout Martin’s story. This all begs the question – that of who Daniel is to Martin, or was. Staring over Daniel’s coffin, Martin confesses his love to him. Is this the first time these words have been spoken? Something trapped inside Martin, a fear of expression due to taboo or the possibility of rejection? Or were the two emotionally close since childhood, when they made that contact against the bulwark of an objective reality? Regardless, for Martin, his desperation to return to that connection between “separation and closeness,” as Clara puts it, drives him to try ever so hard to pull Clara closer. But, he arrives at the Hedgehog’s Dilemma; the need for warmth demands these warm bodies huddle together to survive the cold, yet they find themselves covered in each other’s quills. Clara’s desire to become closer to him, to provide some sort of solace in his time of need, gives way to Martin’s own twisted fears and wants. At one point, having her place herself behind a curtain, Martin presents the same question Daniel gave him: with our hands pressed against this barrier, do we feel each other? Are we closer, here, feeling our forces going at one another? Or does this thin layer of cloth keep us apart, forever unable to truly feel? Clara has him snip two holes in the curtain, one near her head and one further down, allow her to be seen but still not necessarily able to be touched. These holes seemingly represent the two things that can pierce the veil truly and wholly: through our higher intelligence and through sexual actions, inhabiting one another in mind or in body. Having access to these things doesn’t give way to an ability to necessarily grow closer, though. Keeping others at distance seems to be key to the ulterior machinations of Martin’s perceived life. His penchant for obsession, drawing him inward and away from others, distills to an utter sense of futility in his life. This uselessness he eventually resides in is brought out through Frey’s expert editing, as well. There are only a few moments in the game where autonomy is ripped from the player’s hand, namely spatial movement or even the ability to move the mouse to look around. Most frequently, this is during dialogue, but also in very specific scenes; most notably, when we cut back to seeing Clara’s window. The gravitas of these moments of lack of control comes from their infrequency, bringing attention to and drawing comparisons between them. It’s interesting to note that Clara’s window shares the same mechanical absence as our first views of the labyrinth of curtains and of the bathroom door. Hide-and-seek got weird this time around. The labyrinth has about it a sense of existing outside of reality. 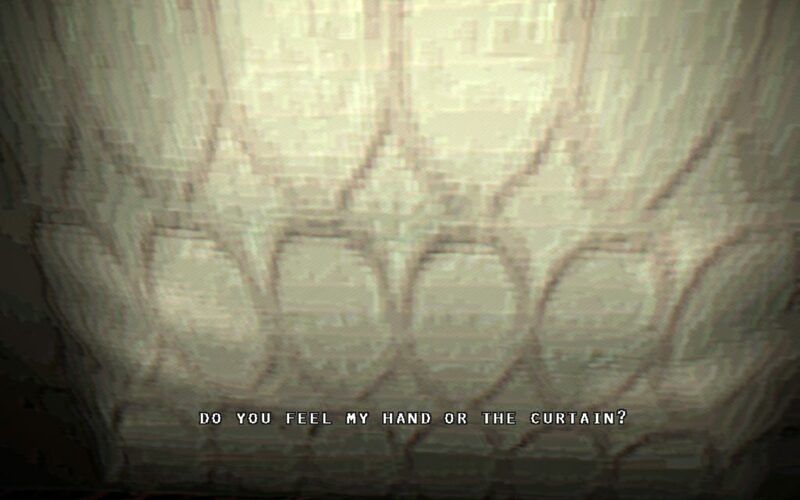 We are whisked into it on two occasions, the second being when Martin uses the scissors to open holes in the curtain. Our first glimpse of it is like a glimpse into Martin’s own mind, a place given form as the literal representation of his obsession with these sheer barriers. Similarly, when we first see the bathroom door, we’re trapped for a moment in the anguish Martin experiences coming back to this moment in time. As he enters, he says nothing, the shower curtain providing a wall of protection between him and whoever it could be behind it; it’s a formative memory nonetheless, bringing us back to Martin’s fixation on the things separating us. Much as he is distanced from the other in the room, we’re not privy to enough information to get around our own barrier of lack of understanding. 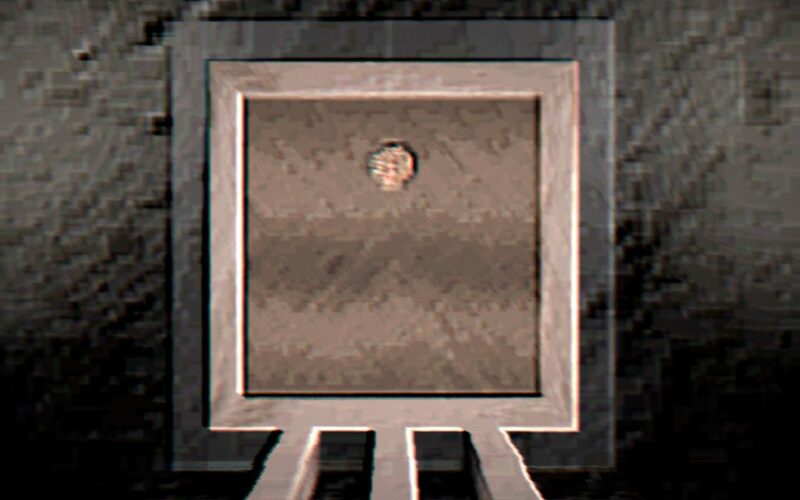 Most importantly, however, the other scene in which we cannot shift our focus is during some of the final moments of the game: staring through the peephole at Clara’s lifeless form, cutting to a static shot of the door on the incinerator eradicating Daniel’s own wooden womb, a coffin serving as the final room we barricade ourselves in to be taken into the afterlife. The door serves as the threshold, much like the window frame of Clara’s room, a literal veil hanging on it, keeping distance between us and the void behind it. Martin’s obsession with birth and rebirth naturally leads into one with death. Living on the shores of what he calls Hell, the understage, he wanders eternally through purgatory. This maze of skeletal supports lies beneath an open ceiling that resembles a ribcage, creating the imagery that Hell may be its own womb, nestled within the belly of the beast. Martin wanders this shore of the river Styx, hoping that one day he can afford to pay the fare to cross from this endless morose world he finds himself stuck in now, alone, without Daniel, without the briefest comfort of feeling each other. Huh, weird choice of a name. Isn’t ominous at all. It’s why he brings Clara into this pit, in the hope that he may be understood for once, that his desperation to be with Daniel can be finally given to him. He sees her a psychopomp, there to bring his soul to the other side of Styx, to a place where he can rest and be free. Unfortunately, Clara can’t do that for him. She wants to care for him, and wants to help him, but it is not her position to serve. Her voyeuristic tendencies place her alongside Martin, a reflection of his own depression, a person there only to comfort but never provide. In the end, her death serves as nothing more than a reminder to Martin that he is forever trapped, never to be saved from this Hell. Becoming part of the thing he cherishes most, his work, must surely give him some final escape from the torment of loss. In some animals, a dead fetus may be subsumed by the mother through the womb. Martin’s death pulls him into this construct of earth and steel, returning his form to the dirt from which he came, a stillbirth in the form of an unfinished work. The architecture he hyper-fixates on, the sacred geometry strewn about his life in his buildings and his carvings, bypasses the man and takes on its own life, absorbing even its creator to further establish its own legacy, as its own entity. These walls and windows and barriers erected only obfuscate what we wish to see, never giving us the solace of being able to reach out to one another and find truth. Instead, we’re trapped, forced to reckon with the notion that we may not have anyone, that we may only have ourselves in this life. Is that person someone worth caring for? If we can’t feel our own selves past the barrier of skin and psyche, do we truly exist? Unable to push past these blockades, one must turn inward, and discover the self we don’t show to others, that cannot exist anywhere but inside. It’s from that inner self that we are able to create, to express, to love. Without holding it close, how are we to ever understand our own desires or needs beyond the animal urges for food, drink, and sleep? There are two holes in the curtain for a reason: one cannot be truly satiated by mind or body, but from the intermingling of the two, of the vulnerability expressed by giving ourselves to each other. Ultimately, these motifs of futility, of birth and death, of isolation, build to an even more important understanding of what Frey offers here. On a basic level, The Space Between deals with a man who wants nothing more than the comfort of first contact with the outside world, the purity of feeling no fear or remorse, of no wants or needs, a return to the void that exists before and after our lives. Endlessly creating faux wombs does not lead to the fulfillment he seeks, and he comes to understand that the only release he will find from this torment is the final release, that of death. He lives on the periphery of Hell in the hopes that it will one day allow him to descend one last time. Glad the gateway to the afterlife at least has a peephole. But, beyond that base interpretation, the game has more to say, more to imprint on the player to carry through this life. 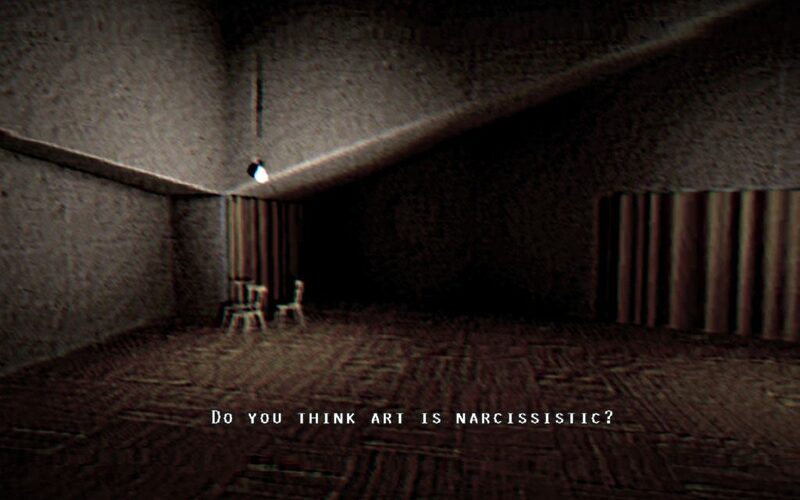 While The Space Between may deal with the architectures of a Man versus Self narrative, on a grander level, the game posits what it means to tackle the topic of Man versus Author. In the third and final part, we’ll return one last time to Hell, to reckon with the abomination of creation and its own sad, isolating properties. Begrudgingly powered by Wordpress 5.0.3. Page generated in 0.059 seconds using 20 queries.